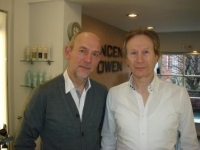 Ian and Owen are master craftsmen in Hairdressing. Their enthusiasm and passion for their work has spanned three decades, and continues to this day. There experiance in the Hairdressing World is Vast,and there Problem Solving is Well Known and Respected . Amanda is a very experianced Stylist who is very creative and who loves working with Colour. Michael is a young and creative Stylist who is looking to build up a reputation for doing creative classically contemporary Work . I am passionate about my Work , particularly colour work of which I have an extensive knowledge .I have completed my NVQs up to level 3 .I love every aspect of Hairdressing. I enjoy teaching and helping our junior team using my Assessors qualification which I achieved through the Salon . You never stop learning in this Creative busy Salon .